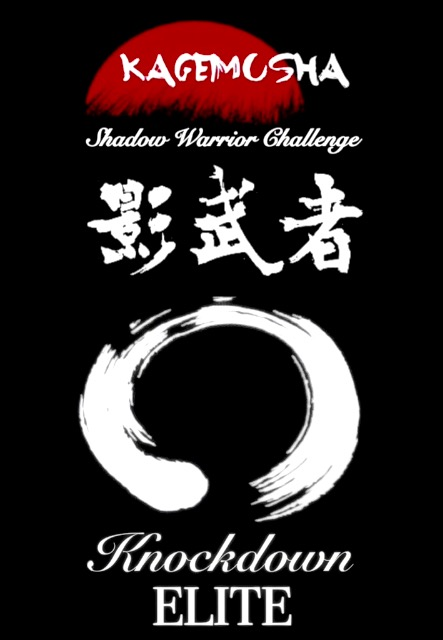 The Kagemusha Challenge is a personal challenge offered to black belt students within Elite Fighting Arts. Open to both Kyokushin & Tsuyoi-Kakuto members. Kagemusha means Shadow Warrior, successful students will be awarded a black Dogi (training uniform) & only these select students are permitted to wear the black Gi during training. This recognition is a well established tradition at DKK (Daigaku Karate Kai) Okinawan Goju-Ryu dojo, under Shihan Gavin Mulholland, who has kindly permitted Elite Fighting Arts & Kyokushin Academy to adopt this tradition, after our dojo assisted with the preparation of a DKK member in the successful completion of the 30 Man Kumite. The test is not a grading requirement and is to be used as a personal test only, it is not compulsory. Only black belts over the age of 18 are permitted to attempt the test. All fights must be 1 minute & 30 seconds long, time may only be reduced if ippon (knockdown) is scored. Full Kyokushin Knockdown rules apply. The fighter cannot be assisted if downed during the test, the fighter must be ready to fight again if downed within 10 seconds or the test will be ended, even if this is during the final fight. The opponent fighters must be of adequate experience. While grade is not a requirement opponents should have a minimum of 2 years training experience. There will be a water break offered of 2 minutes following the 10th & 20th fights, if required. No other rests between bouts are permitted. No protection can be worn on the hands with the exception of minimal wrapping or tape, anklets or shin & instep pads are allowed but not compulsory, a gum shield is permitted. The use of a knockdown approved female breast guard is compulsory for ladies attempting the test. Standard groin guard or cup is permitted. Upon successful completion, the fighter will be awarded a certificate to recognise the achievement & a specially created black Dogi, or uniform (this may be knockdown style or hybrid grappling style, as requested by the fighter). The Gi will be fully embroidered & will also include the fighters name in Katakana on the lapel of the Gi. The fighter will be sponsored by Knockdown ELITE Martial Arts Suppliers & the Dogi will be supplied by us as a gift from the Dojo. All successful fighters will be recorded & listed at the bottom of this page. 30 Man Kumite (fights) Training & Highlight. Unedited Footage of Francisco Filhos 30 Man Kumite.